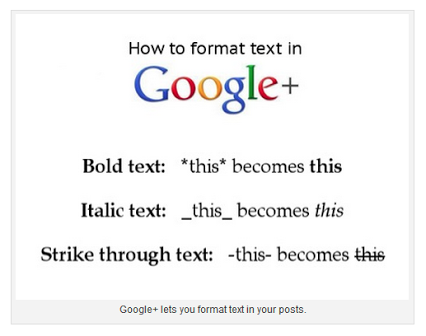 Google+ is designed to focus on one thing and one thing only: engagement. Make your text stand out by adding a little formatting variety to your next Google+ post. Use appropriate line spacing and paragraph breaks to make it easy for readers to scan your content. Use bold, italic and strike-through text to highlight important headings or passages and your post will stand out in the stream.